Online ticket sales at this site ended on Saturday, March 5 at 6:00PM. We have reached the preset limit for online purchases. Some tickets are being held for sale at the door on a first come first served basis. Box office opens at 1:15pm on the day of the concert. Anna Hamre conducts as the Master Chorale presents the World Premiere "Like Streams We Gather" with music by JoungMin Sur and text by Glady Ruiz. Also on the concert program, Vaughan Williams Toward the Unknown Region, Handel's Zadok the Priest, and Mozart's Regina coeli. Coro Piccolo Ensemble presents Bach's Christ lag in Todesbanden. 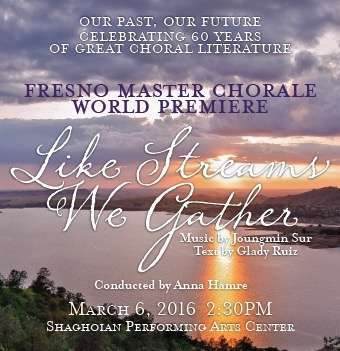 Special appearance by Fresno State Chamber Singers.